Brett and the kids and I packed up late Monday morning and headed west to Shawnee, OK to help celebrate the opening of Sips Kafe, a swanky new joint in downtown Shawnee, that our good friends from college recently renovated. I made sure our trunk was empty and our suitcase light just in case we happened to stop at one of the many flea markets I've seen along the way! Their new place is beautiful and the excitement in the air was infectious. We bumped into some college friends and our kids played together on the stage while we caught up on life (in between a few 'careful's and 'be gentle's). Then we got outta dodge but not before stopping at my favorite thrift store in Shawnee, aptly named Thrift Store. There's always something. I found the four pieces at the bottom of this post there. We stayed at my parents' house that night and then Brett kept the kids so I could peruse Rink Gallery without any distractions. It was my reward for finishing up Modern Patchwork and I was so excited to be away from a computer screen and out on my own. I'm sure some of you moms understand that feeling of freedom but I still have to talk myself out of feeling a little guilty for being by myself. I think I have a two hour timer that goes off in my subconscious and tells me I need to get back to my kids. Anyone else have that? Brett is really great about letting me indulge in flea market stops on road trips. He's always ready to pull over and keep the kids entertained for as long as possible and I try not to push my luck. We've got a good thing. As far as the kids go, they are totally on board with browsing as long as they've been fed recently. They're like hungry little lions when we go too long between road trip snacks. This lovely set of burnt orange, mid-century school chairs were a surprise at the back of the last antique store I visited in Bethany, OK today. It was across the street from Southern Nazarene University and sort of around a corner. It's run by a sweet old man with charm so thick you want to take him home with you. He gave me a nice discount since one leg was missing it's knob on the end. 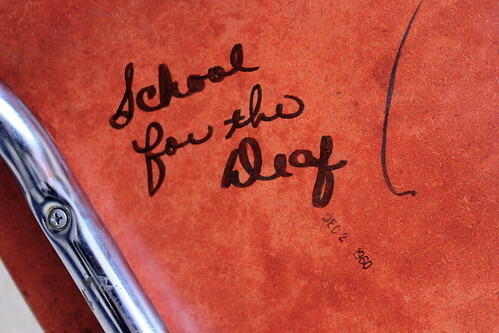 Apparently, it's been used at University Hospital and the School for the Deaf. It's been stamped December 2, 1960. I love knowing a little bit of it's back story. 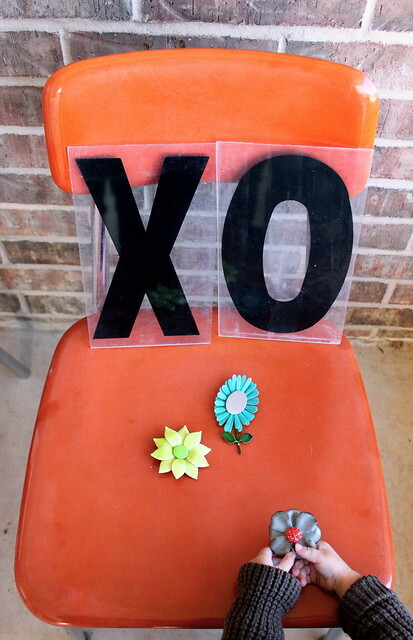 The letters and number are from an old gas station or kiosk and I am one short of an 'XOXO' display for Valentine's Day. (Keep your eyes peeled). The material is a really wide skirt that I have every intention to cut up to use for curtains or a pillow. The Fisher-Price barn was a deal but it has no animals. You remember how Ruby feels about horses, right? Apparently the barn needed a little glam so she used the vintage enamel flower brooches as substitutes. These were from the quickie trip in Shawnee. 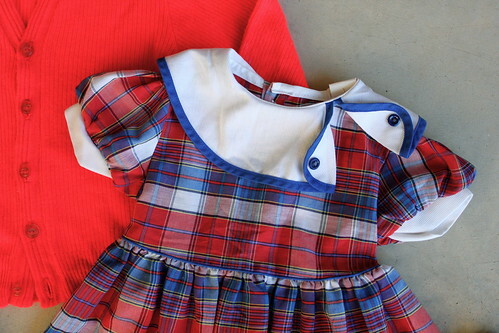 The plaid summer romper reminds me of something I had when I was a kid. I love the unique collar on this dress, too. I'm so thankful to live in the Midwest where treasures like these are not only possible but affordable! It makes a tight budget more exciting, right?! I am kind of excited about heading home and getting the house a little more unpacked and arranged after such a long stint with holiday decor and traveling. These pretty, vintage chairs will end up in our kitchen with a little breakfast table that I've yet to find. It's all going to come together soon enough and finally feel like it's ours! I'm planning on sharing projects as I finish them and doing a house tour in February. What are you most looking forward to this month? It seems like everyone has a goal or resolution they're focusing on for 2011 and the optimism and potential is a little intoxicating to me. Do you have a little list or do you prefer to see where the road takes you? Love. Love. Love. The end. I love that she used the broaches as farm animals.. Being a child is just magical! Lovely finds. I had s few nice finds today at a thrift store. $9 boots! For goals, I never keep my resolutions, so I think I might make one goal for each month. amazing finds!!!! those dresses *swoon*! and i am kind of a fly by the seat of the pants girl but i think this is going to be a productive year! i have already been sewing away!!!! My hubby's from OK, and we lived there for a couple years, bought a little house and moved back to Cali, before he joined the Navy. We loved the Rink!! Espicially me:) He'd spoil me every sunday. After church we'd stop at all the local thrift stores waiting for the rink to open. Then spend an hour two walking through all the sections. Loved IT! I'm not a resolutioner by nature but one things for sure I plan to finally finish the rest of the home ec class I put on hold while he was getting ready to deploy, now it's me and my sewing machine! love it. I totally want to go to OK and find me some thrift shops and flea markets! i love reading the little shout-outs to OK (my former home). and i looooooooove flea markets too! I love that there is a date stamped on the bottom of the chair! That is so fun....oh and that little dress is to DIE for. I read your Texas post last night & this one this morning!! All I have to say is the crocheted dress & these little outfits make me wanna have another little girlie... & that's saying something since I've already got 2 strong-willed ones!! One word for u, ur pics & ur blog as a whole: BEAUTEOUS!!!!! cuteness! and I love that the history of the chairs is written right on then! how cool! Those are some great finds. You have definitely inspired me to do some flea market hunting too! Perhaps this weekend sans the kiddos?!! oh wow.. im so jealous. I wish we had vintage shops in my town! 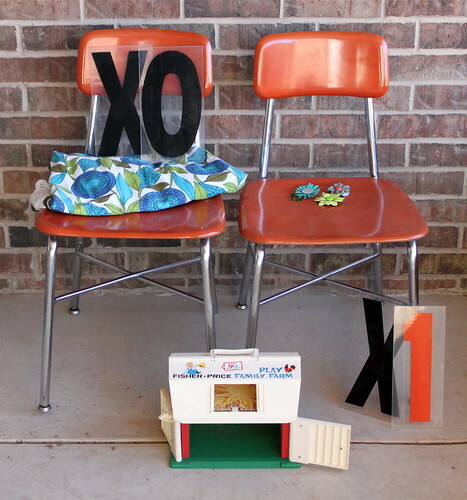 What amazing finds, I am in loveee with the chairs, the little xo's and the brooches! that is a great haul. congrats!!!! You have such a talent for finding the best things! Every time you post stuff my jaw just drops at your scores. Way to go! Great finds! I love that place in bethany. I got my whole set of pink samsonite there for like $15 a few years ago. Super cool finds! I live in Norman, OK and love driving up to the Rink. I will need to go check out the new place in Shawnee. Thanks for sharing! Oh my goodness. 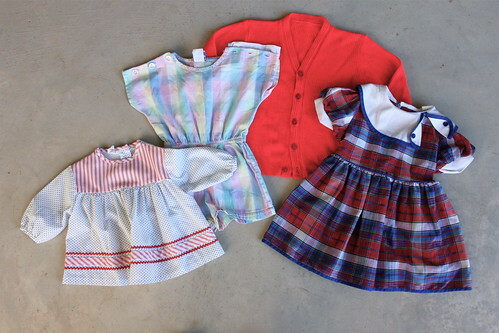 all those little baby clothes are just too cute! Brett is so good, my husband doesnt share my vintage love. He would be ok with letting the kids stop for a fun break though. I have made that same drive many times. I would drive up from hicksville texas to see my sister in OK.
WOW! You found some amazing treasures! 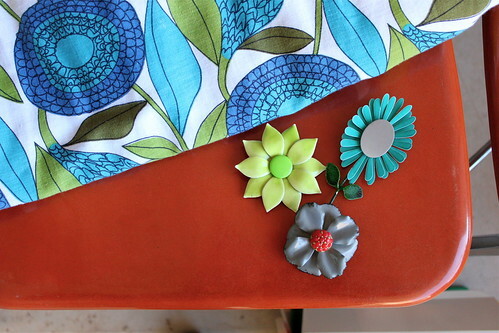 I'm in love with those enamel broaches! I know exactly the feeling of feeling guilty being without kids. It's so silly, because guys get to do it all the time and they don't think about it. You totally need breaks! Those chairs are lovely! 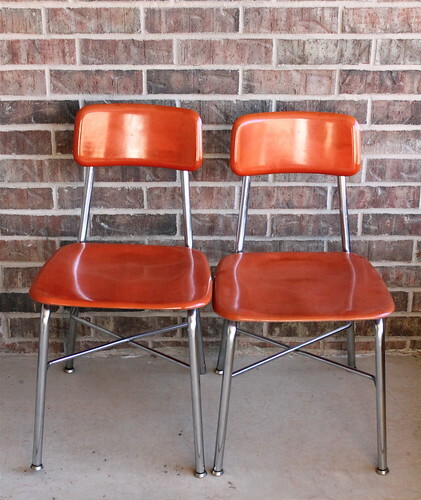 I've been on the search for vintage school chairs for awhile now, no luck just yet! Awesome that you were so close to SNU (Southern Nazarene University). I am a Nazarene and know lots of people who have gone there! great finds!!!!!!! I need to get out and thrift shop more often! dang! you really did hit the jackpot!!! may your thrifting luck continue! wish me luck, me and my sis (and the three little ones) will attempt to thrift tomorrow, but i doubt my luck should be as good! I always have the mommy guilt. I dont know why I feel like the sky will fall if I am not there. I need a break and plus I always come home and the kids are doing great my husband is calm and life is just peachy. It is like a new adventure for them all that they love, when I am home day in and day out with them my husband come homes to chaos and a momma about to pull her hair out! I have a booth at Rink Gallery!!! It's called Underground Daffodil. Can't believe you were there. I went up to put some record bowls in my booth Monday. Must've just missed you. :] Looks like you found some great stuff! great finds! love your blog, dear!